Melancholy Sky is set to be released as download on January 8 2012. It will the leading track of Goldfrapp's Best-of 'The Singles, to be released in February. Melancholy Sky is the follow-up of Goldfrapp's latest single, Believer. You can purchase and listen to a snippet of Melancholy Sky via AMAZON. On 6th February 2012 electro-pop icons Goldfrapp release The Singles, a career-spanning overview featuring tracks from their five critically acclaimed albums, alongside two brand new songs written especially for this release: �Yellow Halo� � a slow building synth-pop wonder, and the introspective and defiant new wave ballad �Melancholy Sky�. The Singles, is the first compilation from the band, taking in the cinematic electronica of their Mercury shortlisted debut album Felt Mountain, through the electro glam of Black Cherry, the Grammy nominated, half-million selling dance pop of Supernature, the Pagan, electro-folk of Seventh Tree and last year�s, top 10 album, the hands-in-the-air, retro-futuristic Head First. The Singles is released on 6th February through Mute/Parlophone, and available to pre-order now. Goldfrapp performed an acoustic set last November in support of Mencap, as part of the Little Noise Sessions at St-John-At-Hackney Church in London. They mainly performed tracks from Seventh Tree, plus an unreleased song entitled Melancholy Sky (to be featured on their upcoming 2012 Best-of). While the band is touring to promote their album Head First, a live recording of their Bristol performance can be purchased on gig nights. It is a double CD housed in a digipack, released thanks to AbbeyRoad. In 2005, Goldfrapp did likewise with LIVE HERE NOW during the Supernature Tour. Goldfrapp performed their new single Believer live on the Alan Carr show, on Channel 4 last weekend. You can watch the performance via You Tube. Believer, the third single to be lifted off Head First, is set for release on September 6th 2010 through Mute. The promo video for Goldfrapp's next single, Believer, is available on the official YouTube of Mute Records. The video, filmed & edited by none other than Alison's girlfriend, Lisa Gunning, features visual elements from Head First summer tour, as well as some exclusive backstage snippets. The third single is out early September, on CD & Download. Goldfrapp performed 16 tracks live at the London Roundhouse for the iTunes festival 2010 a week ago. A Live EP, consisting of a selection of six live tracks, can be purchased off the iTunes platform. Here is the list of the existing remixes of Goldfrapp's third single to be taken off Head First, Beliver. They are featured on the uk 5 & 8 track promo CD's. Check the discography for more details. The mother of Alison (one half of Goldfrapp) has passed away. Our deepest thoughts are with Alison and her family circle at this time. Peace. Believer is set to be the third single off the album Head First. It is out on September 6th 2010 in the uk. The Vince Clarke remix edit is available on the remixer's site and Davide Rossi's reinterpration of the track can be listened on the band's MySpace. Moreover, you can listen to the wonderful Vampire mix of Alive by Chris Goulstone and The Chapel of Rock here : Alive (Vampire mix). Goldfrapp will play at the new Trianon in Paris on Monday 22nd November. All the gigs are in the gigography. Alive is set to be released on June 9th as the second single from Head First. You can listen to most of the above remixes through MaxiPromotion. Goldfrapp performed live their first single Rocket on BBC1's show, Friday Night with Jonathan Ross. Their latest performance on this very show was Happiness. You can download the performance here. They will be performing Rocket live on Pro7's show, TV Total, in Germany on Wednesday. Check the gigography. Goldfrapp have performed their new single Rocket for the first time in Milan, Italy. It was aired last Sunday on Rai Due during the show Quelli Che Il Calcio, and the performance of the radio edit of the track was lip-synched. Screencaps are available in the gigography and the performance can be viewed on youtube. 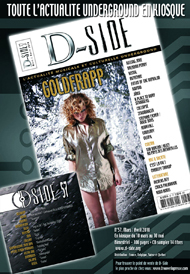 Goldfrapp hit the cover of the fifty-seventh issue of French magazine D-Side (march/april 2010). Rocket (Grum remix) is featured on the bonus promo CD. The magazine is available in France, Belgium, Switzerland & Quebec from March 10th to May 10th 2010. The video for Rocket premiered on MSN a few days ago. Now it is available for your viewing pleasure on the MUTE You Tube channel. The video features the radio edit of the track. Click here to watch the video. The video for Rocket will be available for download on this coming Monday. So far, there has been a European watermarked digital promo for Head First. Check the discography. Pending the above tracklistings to be announced, check our discography to find out about the 2 existing promo cd's for Rocket : the uk 2 tracker and the uk 7 tracker. Head first is released in Australia on March 19 as a special edition. The edition will feature an exclusive remix bonus disc while stocks last. Goldfrapp is on a whole new health kick. After drinking down their breakfast smoothie of Olivia Newton-John and Hall & Oates, they take their purple Van Halen �Jump� pills and don spandex and sweatbands for an hour long work out with Jane Fonda. They must be getting fit for Xanadu. �Rocket� is the duo�s propulsive new single that�s a glorious rush of synth euphoria from their new and 5th LP Head First out March 9th. With breathy fantasy, Alison Goldfrapp sings about taking you on her rocket and never letting you come down. It�s the kind of song that makes you feel like there�s a wind machine running through your hair or you�ve just eaten a Peppermint Pattie. The remixes are absolute giddy good fun. Tiesto turns out seven plus minutes of pure disco anthem pleasure. Richard X, Penguin Prison and Grum all stab and succeed at glittering, swirly, splashed-out, high 80�s pumpers. 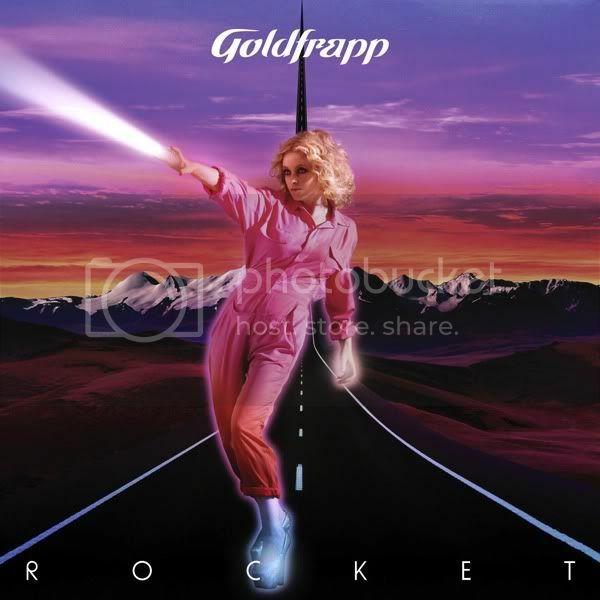 Besides, you can download the HQ cover artwork for Rocket by clicking on it. The album is set for release on March 22 2010 through MUTE. Here is the official cover artwork for Goldfrapp's new single ROCKET from their upcoming album HEAD FIRST. To listen to an audio clip go to AMAZON.DE or download it already from iTunes Australia. Here is the cover artwork for HEAD FIRST, GOLDFRAPP's new album. Goldfrapp got a mention on the Stuart&Maconie show on BBC Radio 2 on January 9. Download here.